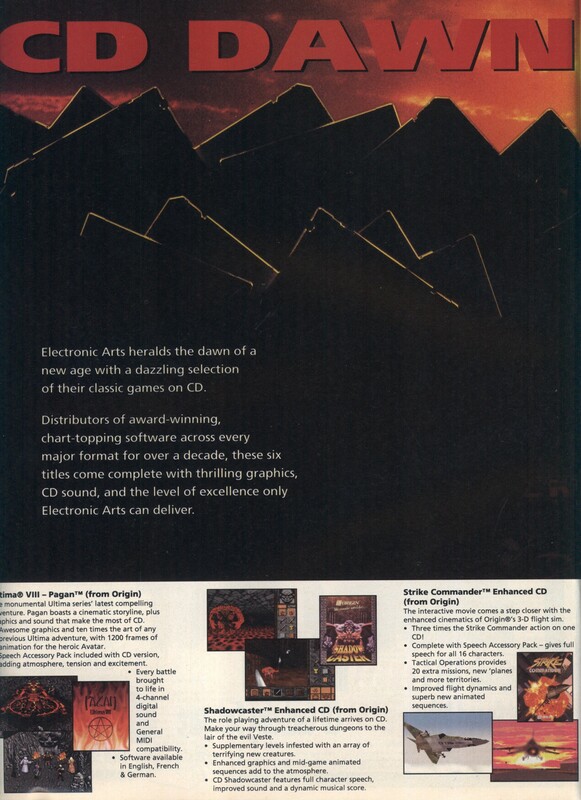 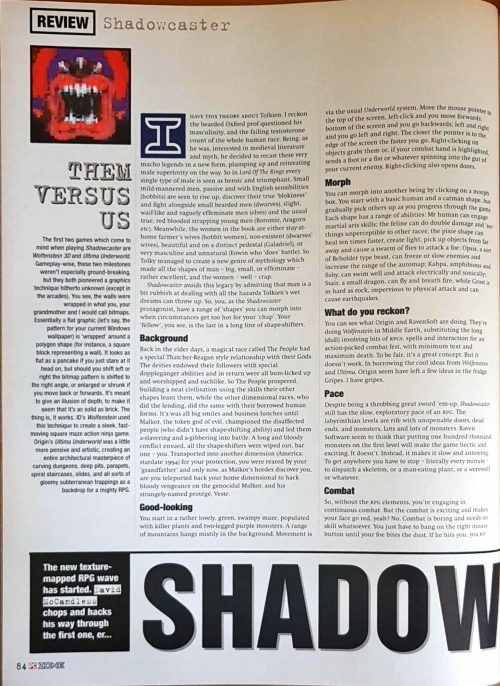 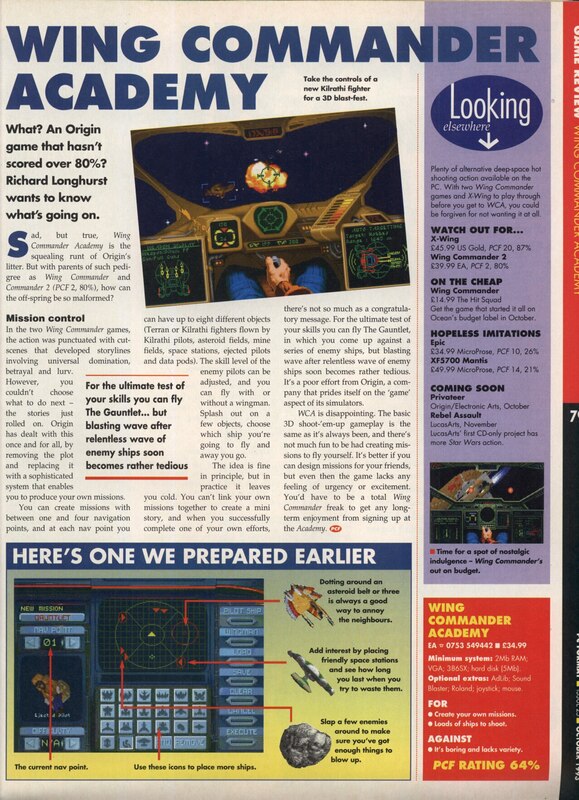 This review of Shadowcaster comes from the January 1994 issue of PC Zone, courtesy of the scans from Ian Williams. 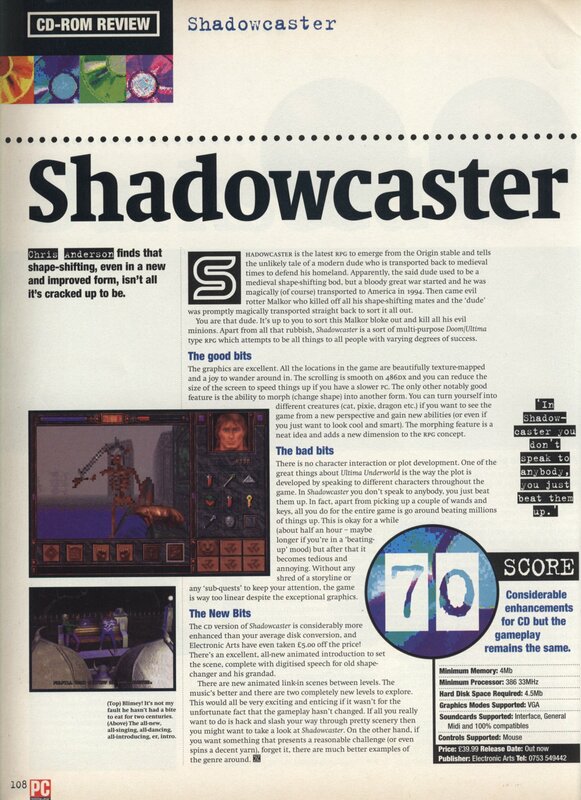 I liked Shadowcaster more than the reviewer did but I can understand the problems they have with the gameplay. 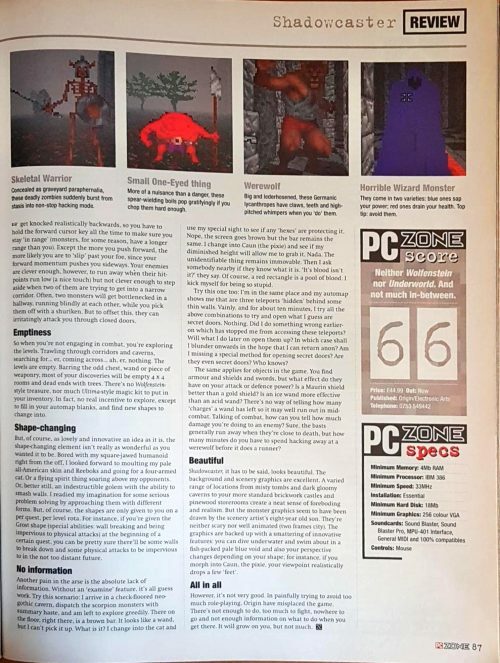 It was slow-paced to the extent that I recall only being able to beat it by changing into the fast-healing character and walking away from the keyboard for 30 minutes at a time while my health regenerated. 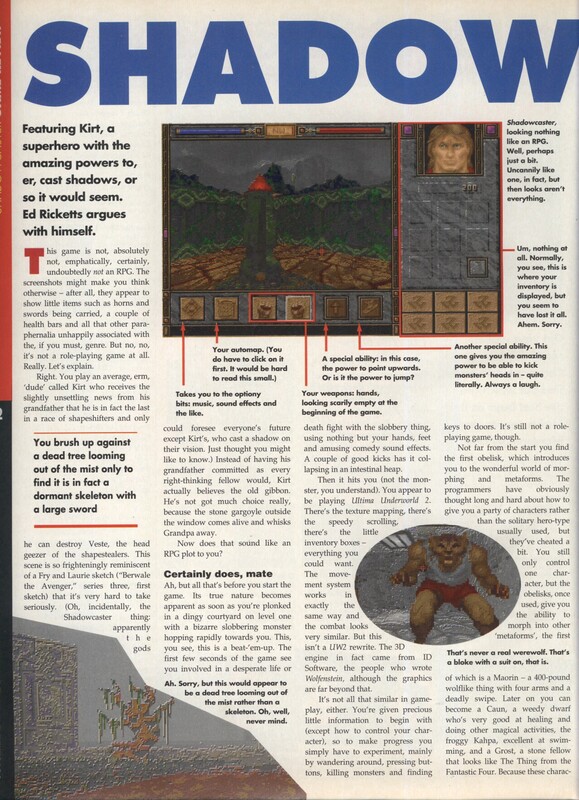 I’ll also give quick mention to the first part of a Matt Chat Youtube video with the Fat Man aka. 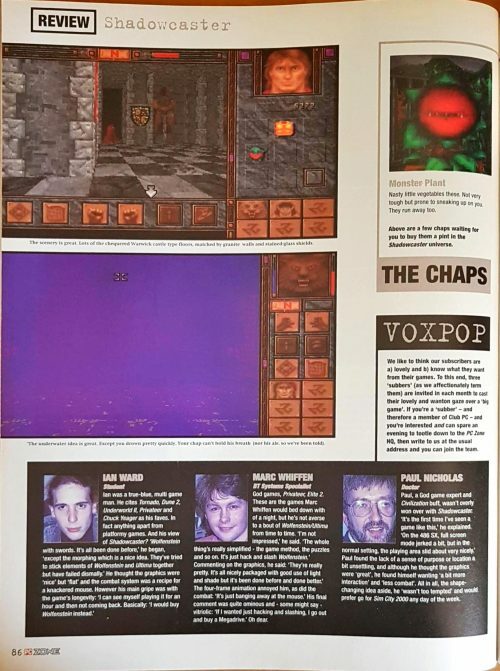 George Sanger who should be a familiar name to Origin fans since he did the music for Wing Commander, Savage Empire and Ultima Underworld among many other games. 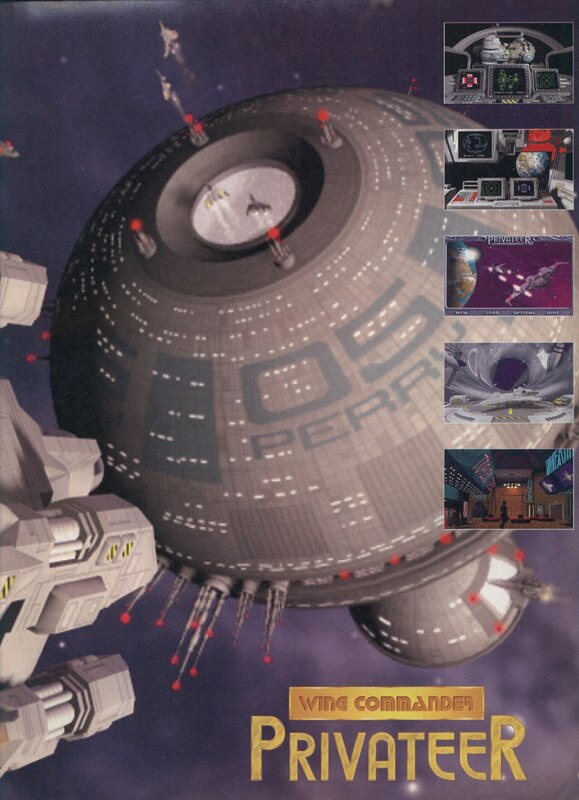 It’s definitely worth a watch. 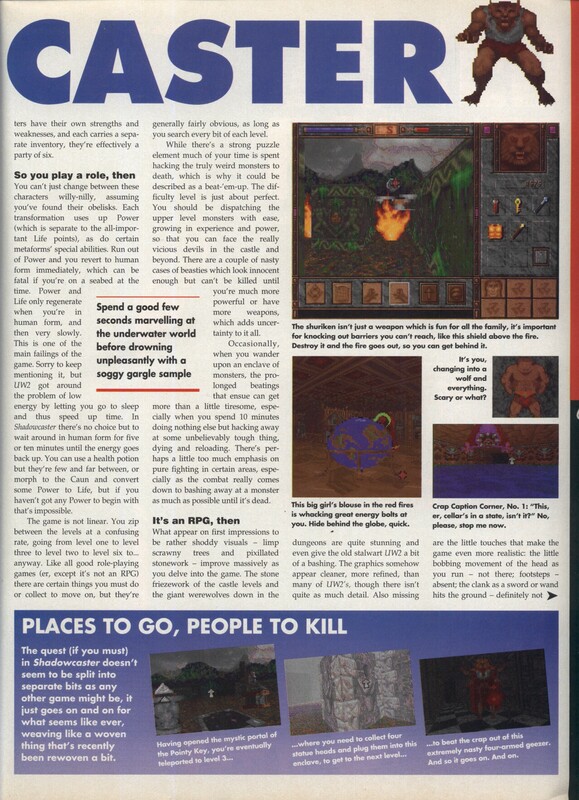 I could have done with reading this particular review before I played the game myself. 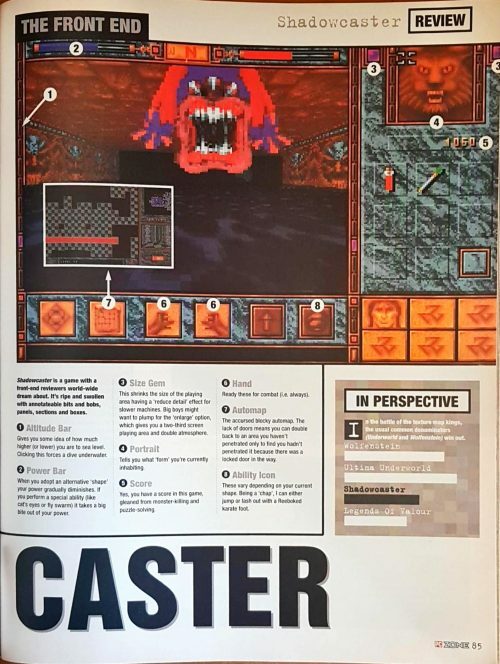 I’d only seen the marketing and screenshots and was expecting another Underworld. 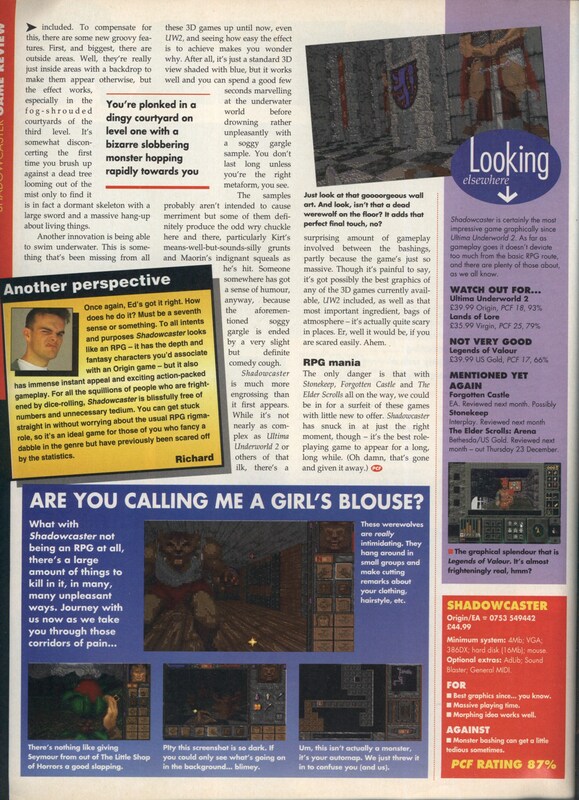 I still liked the game enough to finish it but the waiting around referred to in the article does get a bit much. 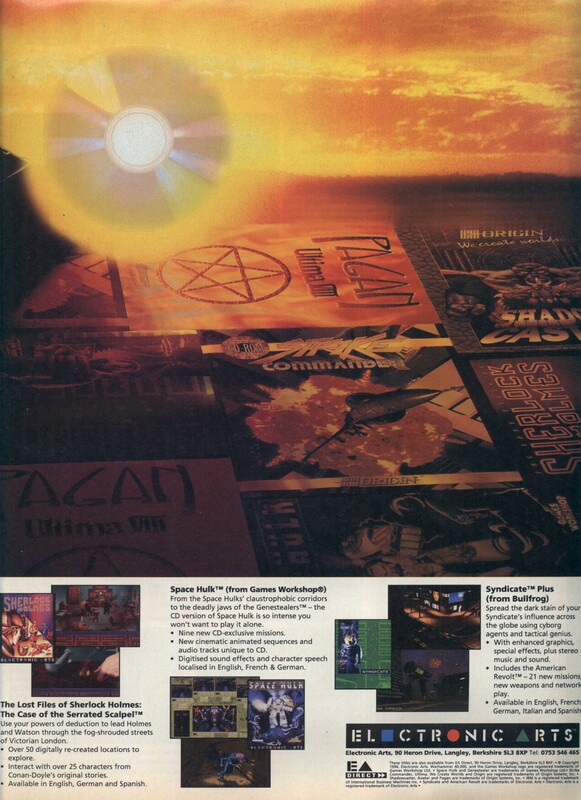 If you aren’t careful in the combat, this is the sort of game where you could read a book or watch a few movies during the pauses while you heal up. 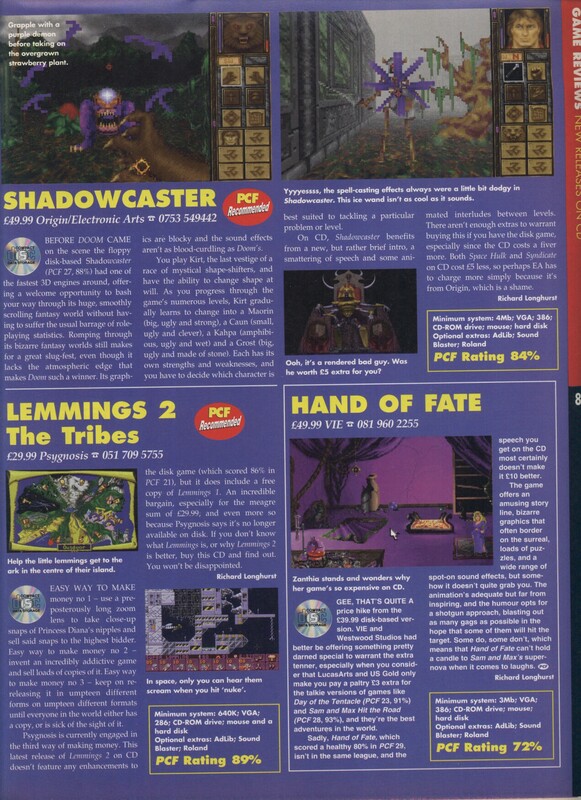 I’m not entirely sure but I think I might have picked Shadowcaster up originally not long after it came out when I returned Privateer. 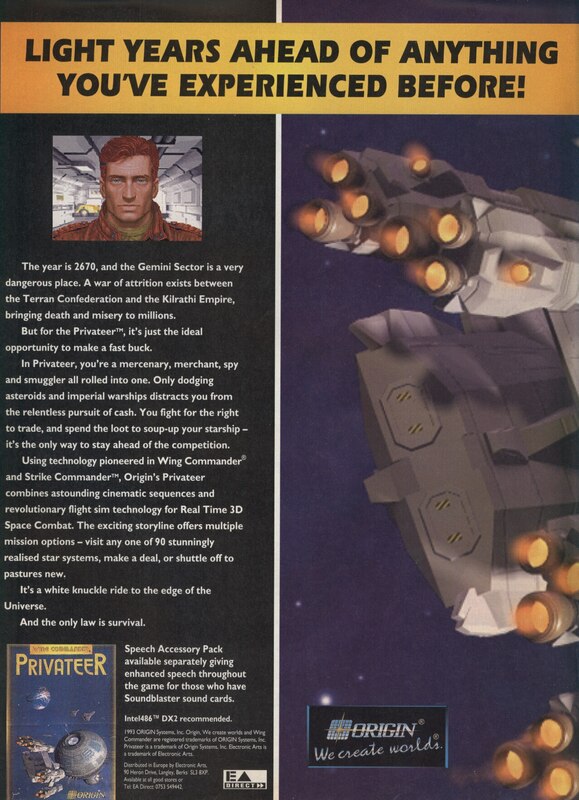 Returning Privateer seems like sacrilege now but in my defense it simply wasn’t playable with the stated minimum specs and the price tag was a small fortune to me at the time. 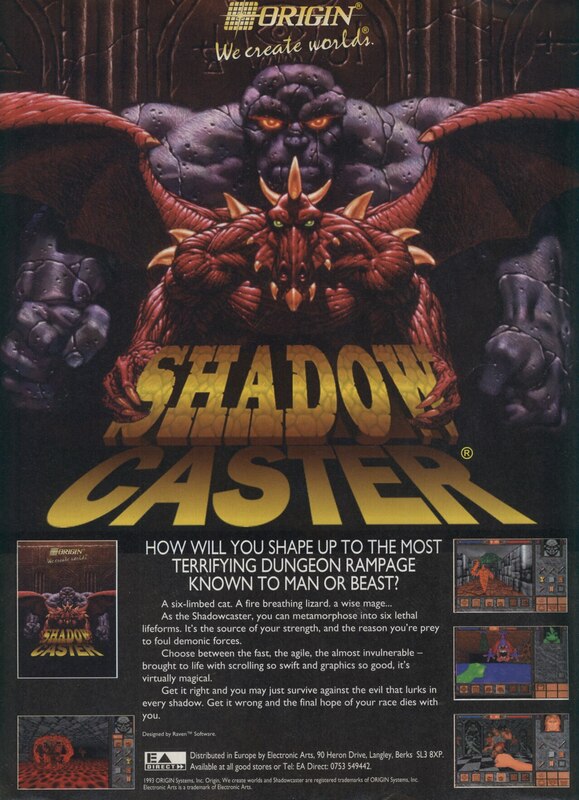 One of the main appeals of Shadowcaster on the other hand was just how smoothly it ran in a large window on a student grade PC.